One of my best buds Chris was in town last week for work trip to Boulder. Chris was a key protagonist in many of my near-death experiences during that 16-24 year-old phase of manhood when your judgement hasn’t quite kept pace with your physical progression. On one particular occasion Chris & I were the passengers in a car heading home after an all-nighter expedition to a hot spring when the driver fell asleep at the wheel and crashed into grove of saplings. Not to blame the driver; everyone in the car had fallen asleep–except reliable Chris. He was wide awake. Unfortunately he was in the trunk since our 2 door sedan only had room for 7 passengers in the main cabin. 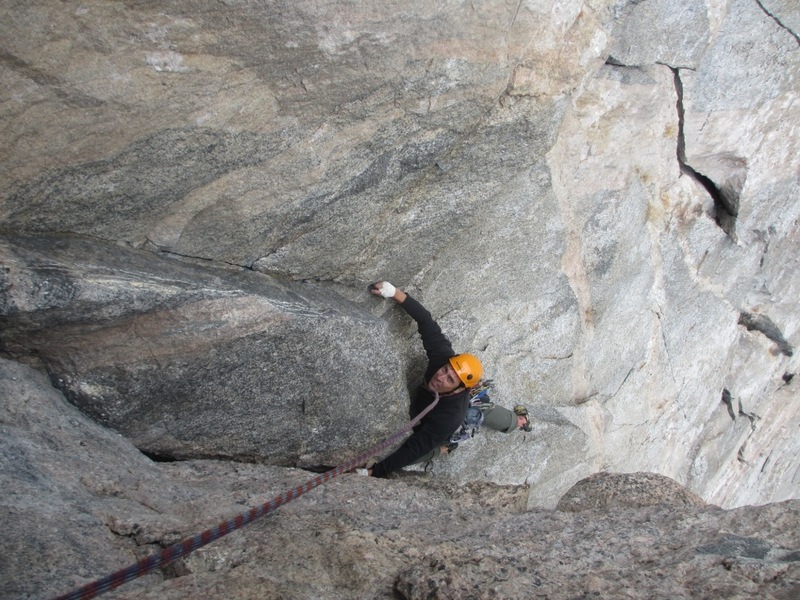 Anyway, with the absurd heat-wave on the Colorado Front-Range this summer, we were looking to beat the heat with some casual alpine climbing, and nothing fits that description better than the excellent granite walls flanking Mt. Evans. 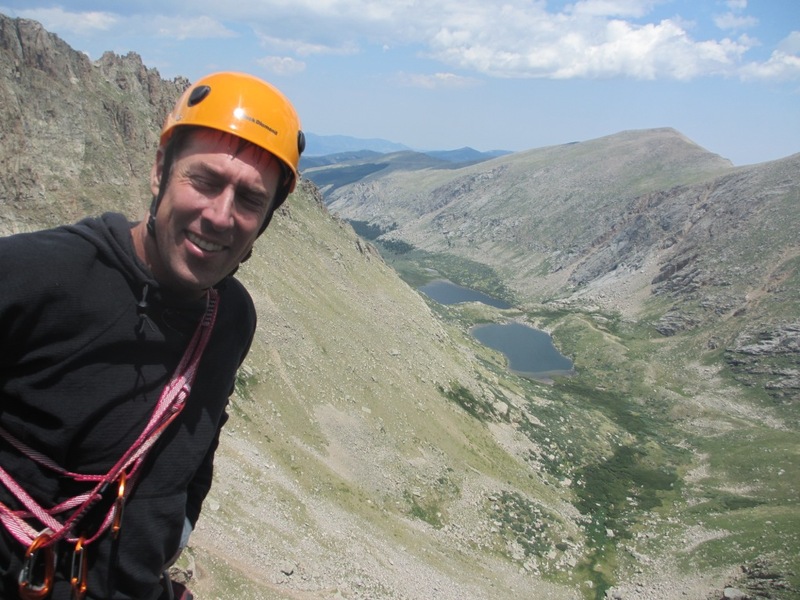 The Black Wall lies about a mile north of Summit Lake, topping out at a bit over 13,000 feet, so named for its resemblence to the notorious Black Canyon of the Gunnison. Our objective for the day was the super-classic “Good Evans”, said to be one half Yosemite, one half Black Canyon. The Black Wall: Good Evans climbs the next crack system left of the really obvious crack system (which is The Road Warrior). After a 7:30 alpine start we headed up the twisty Squaw Pass Road. It never ceases to amaze me how fortunate I am to live in a place with so much accessible rock. To be able to get from my doorstep to the trailhead in less than an hour seems like cheating. The approach turned out to be harder than I expected so I guess that makes up for the easy drive. From the view point at Summit Lake the Black Wall appears to be an easy stone’s throw away, but the reality is you have to hike over a significant ridge to get there. Coming from near sea-level, Chris was not psyched on this ridge that I failed to mention. The hike turned out to be fairly enjoyable, and we were able to locate the rap station with no trouble. I had some clever beta that would allow me to skip one of the 4 raps with a 70m rope, but at the end of the first rap it became clear that my 70m rope was not as long as I had expected. Fortunately this type of “jiggery-pokery” (as the Aussie’s would say) is my specialty, so we were able to make it to another anchor, but after the added delay, we were both psyched to get on the route. The first two pitches were absolutely stellar, every bit as good as advertised and easily worthy of Yosemite Valley. This was probably the best granite I’ve touched in Colorado. The first pitch started out with some moderate flake climbing, then some bomber splitter cracks, leading to a short boulder problem crux. This section required some awkward lie-backing up an offset seam. 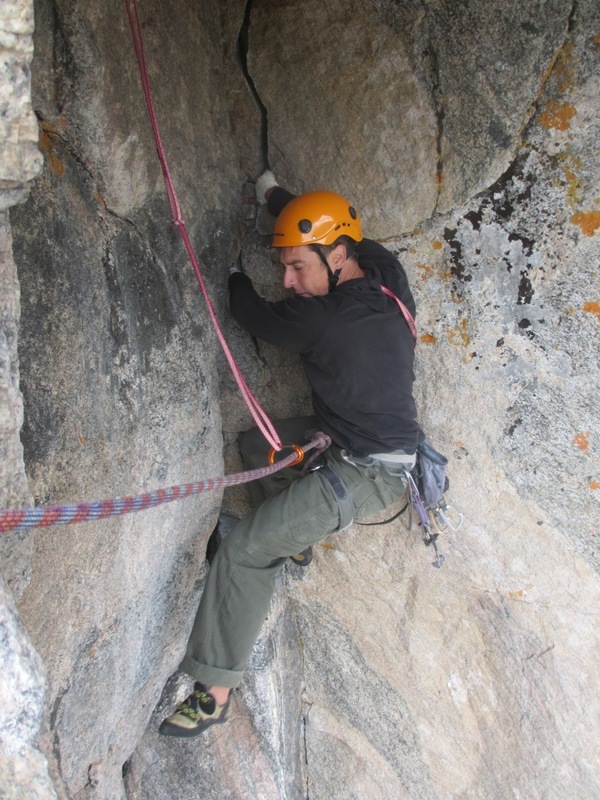 The handholds were great but the footholds were small, sloping bumps that required good confidence in your footwear. I was wearing my new Tenaya Ra slippers and they were well up to the challenge. Chris gives the Black Power salute to the end of pitch 2. After the boulder problem a long traverse leads to a small grassy ledge and the typical first belay. I still had a huge rack of gear and plenty of rope so I decided to link through the second pitch. This ptich starts with a fun lieback up a precarious but bomber detached flake. In order to protect the second on the traverse at the end of P1, I chose to run it out past the flake, which made things a bit more spicey than usual. The next section was absolutely out of this world, 5-star hand jamming up impeccable granite. Bomber jams and bomber gear in an amazing alpine setting. 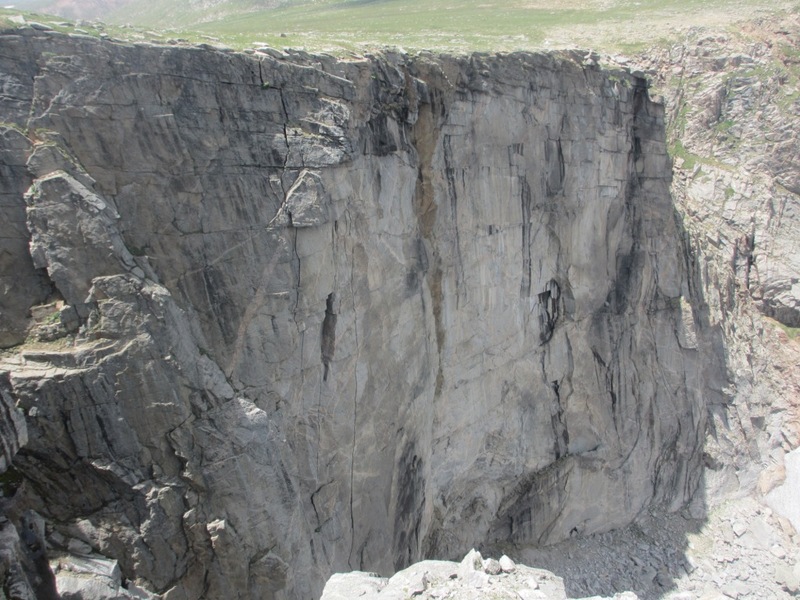 The only catch is that the crack widens slightly over the last 10 feet before the belay. I have relatively small, girl-ish hands, so I was full-on fist-jamming through here. Not my forte, but fortunately the footholds were plentiful so I was able to escape with minimal bleeding. I set up a belay in a flared groove of Black Canyon-esque pegmatite below an ominous & puzzling roof. Chris quickly followed pitch one. Despite limited crack climbing experience he cruised through the splitter sections in fine style. Chillin’ at the first belay. 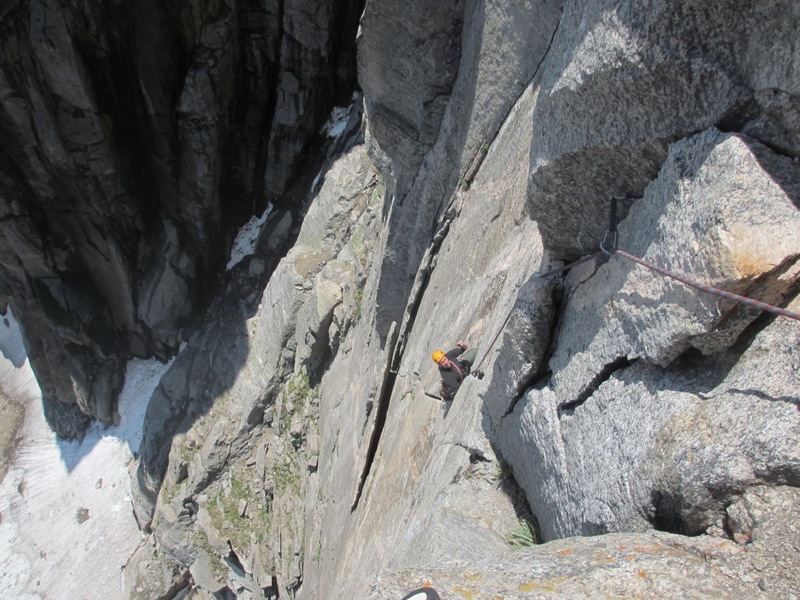 The next pitch begins with some easy chimneying and deceptive route-finding, culminating in a spectacular traverse around the arete–from no exposure to 400 feet in one step. A few more moderate but intimidating moves lead to the next belay, and exposed perch high above the Chicago Lakes Basin. Just before the P4 capping roof. For those unfamiliar, this is the “What did you get me into?” look. The next pitch, though not the best rock, is probably the most memorable and the most notorious. This pitch follows insipient cracks up an awkward leaning corner towards another ominous roof. The entire lead I was straining for some clue as to how I would surmount the seemingly impregnable looming roof. Things seemed to get steadily harder as I climbed, with a slight pump getting progressively worse, unti I reached a good shake right up against the roof. At that point a Gunks-style line of jugs revealed themselves, leading left and somewhat down around the arete to the left. I plugged in a good cammed and monkeyed my way around the corner, swinging my feet around the prow to reach a huge ledge and the belay. Chris followed with ease and we quickly finished the last short pitch to the summit. About to make the committing step left. The last belay with the Chicago Lakes Below. 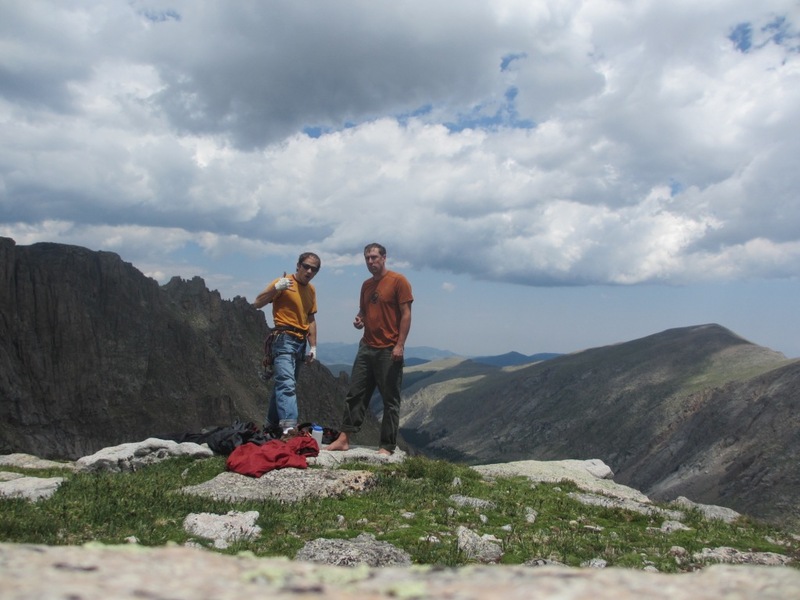 The bulk of Mt Evans’ bouldering is found in this valley. 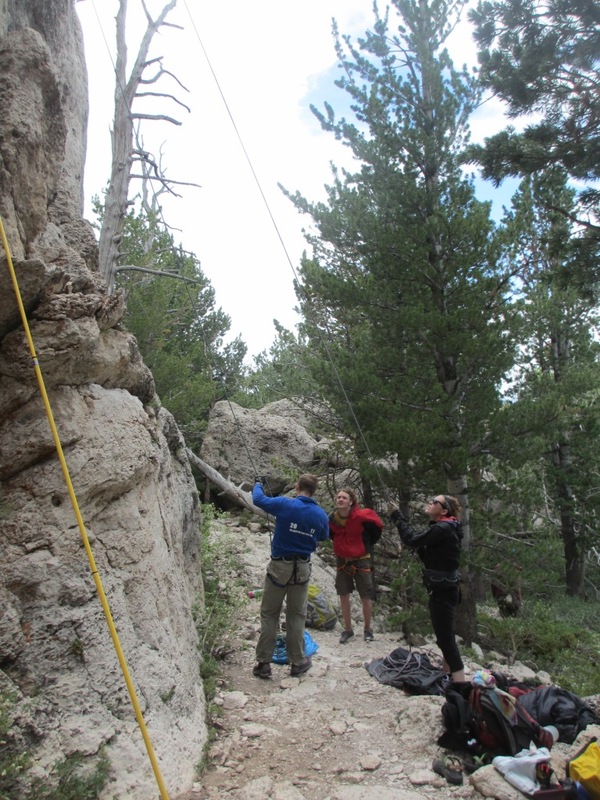 Last weekend was the annual International Climber’s Festival in Lander, Wyoming. I ran into a lot of old friends and made some new ones, and generally had a fantastic time chillin’ with the Trango crew. One of the highlights of the trip was when my good friend Steve Bechtel introduced me to one of my early climbing heroes, Steve “Nitro” Petro. Petro on his Piece de Resistance, Fiddler on the Roof, Fremont Canyon, WY. Among other things, Steve did the first ascent of “Fiddler on the Roof”, a ridiculous 5.13d finger crack featured in the original Masters of Stone. Steve also starred in the training video Fingers of Steel with Tony Yaniro and Steve’s wife Lisa (nee Gnade). This video has been somewhat overlooked in recent years but the principles discussed still hold up today. Not to mention that the guys had a great sense of humor and a lot of fun putting it together. After Performance Rock Climbing, FoS was the next greatest influence on my training. Steve & I talked about his thoughts on training, the value of agression in climbing and our mutual admiration for the late great Todd Skinner. 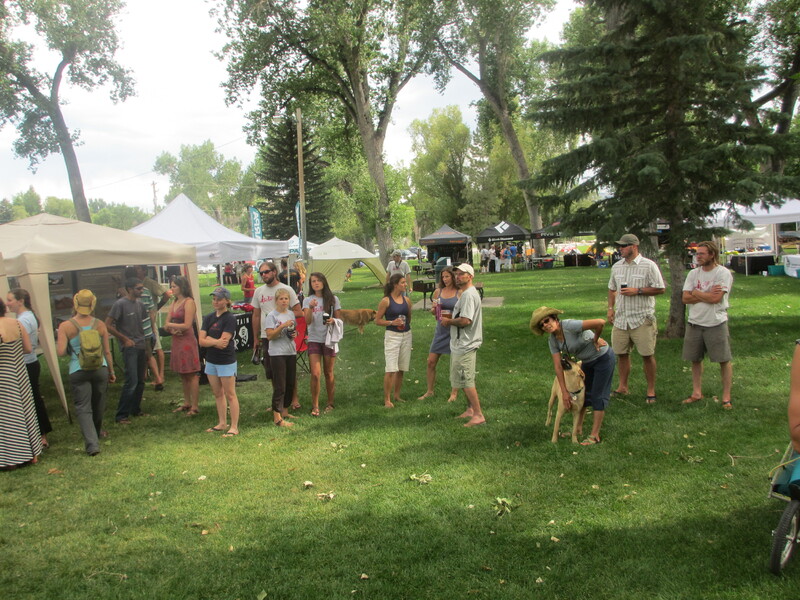 The first big event was the Trade Fair in City Park on Friday evening. I was a little anxious about the 3pm-11pm timeslot on the schedule, wondering how I would make it through 8 hours. In the end it turned out to be 8 hours of non-stop entertainment, partying and general tom-foolery thanks to the many colorful characters of the local Lander climbing scene. Good Times at the Trade Fair. 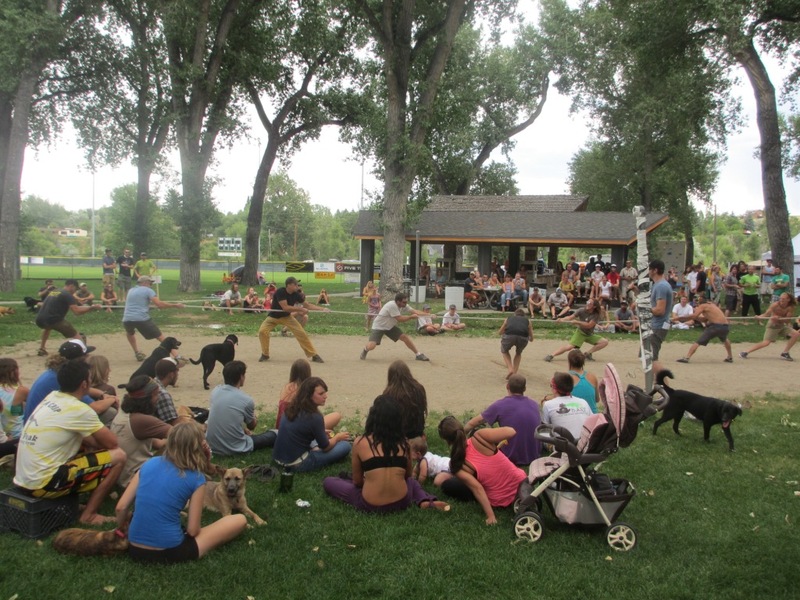 The Festival had a non-stop lineup of friendly contests and stupid human tricks that kept everyone thoroughly entertained. During the lulls we met a lot of great folks while repping all of the latest Trango gear. There was a ton of interest in the highly-anticipated Tenaya climbing shoes that Trango will begin distributing in August (expect a full-review in the next few weeks). Considering how little info is available in the US about these it was amazing to see the buzz surrounding the Spanish brand. Cowboys vs. Hippys; guess who won…. The first big event was the Tug O’ War, dominated by the local squad, anchored by a couple of my friends Colby Frontiero and (the legendary) Steve Bechtel. Needless to say the team of roughnecks and Bronc busters simply destroyed the competition. 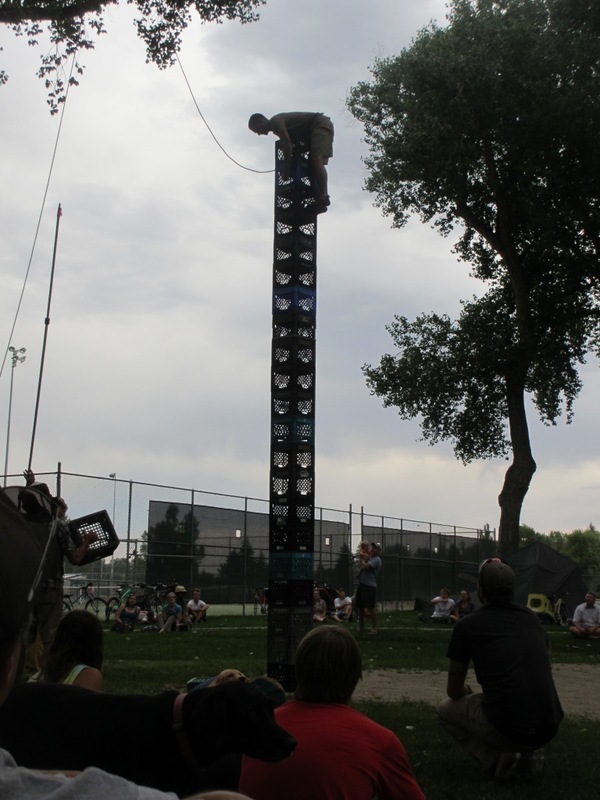 The next event was the Crate Stacking Competition. I had never seen this in person before so I was really psyched to check it out and try to gleen the technique. If you’ve never seen it before its worth checking out. The best way I can think of to describe it is slacklining for engineers. The game is simple, stack empty milk crates as high as you can. Simple enough until you get into the double-digit range. 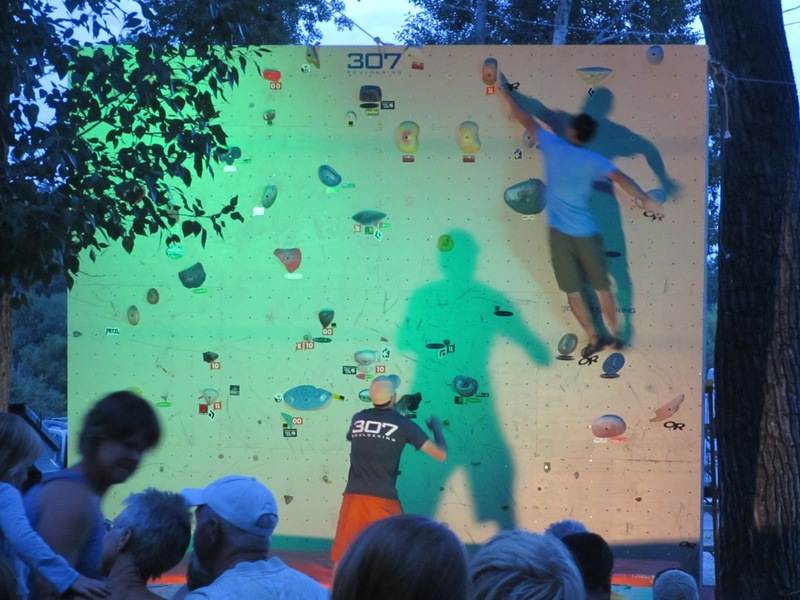 Hands down the highlight of the night was the Dyno Comp, put on by the boys from 307 Bouldering. It featured great competition and some ridiculous V-Double Digit problems. The competitors were psyched and so was the crowd which lead to a great finish. The big event for me on Saturday was the Tenaya shoe demo and the “Try Hard” Clinic that I taught with my new friend & Trango team-mate Chris Barlow. Chris is a great guy and I had heard a lot about him through Mountain Project and some mutual friends, so it was great to finally meet him and do some climbing together. Neither of us had ever taught a clinic before so we weren’t quite sure what to expect, but it turned out to be a really fun time for everyone involved. I love the unbridled enthusiasm and joy that you find with folks just discovering the sport of climbing. It really takes me back to the simple things that first inspired me to step out into the unknown and seek out the mountain tops. Three of the guys in our group had driven 14 hours from North Dakota just for the festival. That kind of motivation is hard to beat. Just about everyone in our group was in their first year of climbing, so we discussed some basic concepts, including Chris Barlow’s Axioms for Trying Hard (TM), and then asked each of the students what they hoped to get out of the clinic. 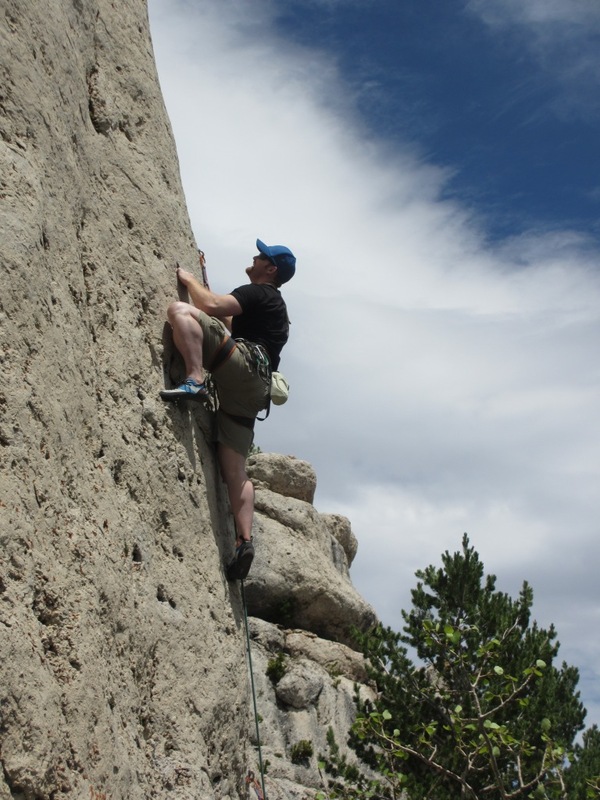 In my experience the best way to help someone improve is to simply watch them climb (or train) and provide direct feedback, so we jumped right into climbing. It seemed to me that everyone in our group made significant improvment over the course of the day and I hope they can continue to benefit from whatever they took away from the clinic. With the clinic wrapped up Chris & I drove the long way around to Sinks Canyon to meet the rest of the Trango crew (Adam and Brendon) for some cool-down laps in the Killer Cave. Chris & I each took a run on the incomparable “Bush Doctor”, then set up for a quick photo shoot on “Busload of Faith”, complete with a healthy amount of “You’re a monkey Derek” and other classic Zoolander lines. Unfortunately the wardrobe department failed to deliver any bright t-shirts to the crag, as we were all clothed in our official Team Trango shirts. Don’t get me wrong; the shirts are sweet, but the speckled-black color is not “right” for quality photos. After some “not it” back and forth and some good-natured heckling, Chris graciously offered to run back to the car to grab an E-Grips shirt that was the perfect color. Probably not what Chris expected when he joined the team, but we tried our best to convince him it would be great training for his upcoming Bugaboos trip. He made the round trip in just about 10 minutes; a super human effort–Thanks Chris! Once the photos were in the can I headed home for a climbing appointment in Denver the next day. It was a great festival and I had a blast; really looking forward to next year. Intensity is simply a matter of how much effort you put into a given training activity. In other words, how “hard” you are trying. You may already be performing the prefect training activity, but if the intensity is wrong, you won’t get the proper results. After observing many climbers in their natural habitat its clear that intensity levels vary greatly between climbers. Unlike pure aerobic sports (where a good heart rate monitor or power meter can do the trick), intensity in climbing is difficult to quantify, which makes it very difficult to prescribe. It also makes it very hard to get accurate feedback as to whether the proper intensity has been applied. However, finding the proper intensity for each training activity is vital. It is absolutely possible to follow a precise training plan and see few results if the intensity is wrong. There are two primary culprits, the first and most obvious being that many people just plain don’t know how much effort to apply (and many don’t realize how much effort they are truly capable of). That is primarily what I would like to address in this post. 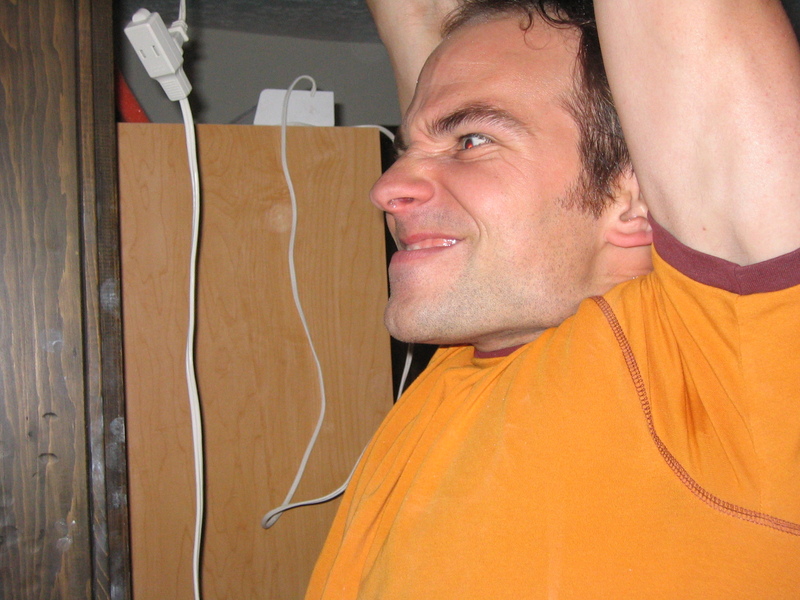 Applying the proper intensity during a hangboard session. Its worth noting there is a potential to apply too much intensity, especially when recovering from injury, but in my experience the opposite problem is far more common, particularly among folks that came to the sport of climbing without much background in other organized sports. If you’ve never really pushed your body to the limit you will have trouble knowing just how much effort to put into a workout. Not all pain is bad, and its worth discovering the difference. If you have access to an actual coach, it may be worth the money to have them assess your training intensity in real-time, but most of us will end up figuring it out on our own. – Local Endurance Training: AKA “ARC” or “CIR”, the earmark of this training is its LOW intensity. Sounds simple, but this can be one of the most difficult to gauge correctly. Even if you find the right intensity, it can be difficult to keep it up for the long set lengths involved (routinely greater than 30 minutes). The danger of too much intensity is that the effort will become anaerobic, theoretically producing different results than those desired. In my experience most climbers err on the side of too little intensity and I think this is a mistake. These workouts should not be effortless; try to push yourself by climbing on steeper terrain or avoiding the best holds. Avoid vertical (or slabby) terrain and any hands-free rest stances. If you have a heart-rate monitor you might try using it for these workouts to establish a baseline, but don’t assume it will correlate to big-muscle aerobic exercises like running or swimming. If you struggle with finding the right terrain, consider a “Fartlek” style workout, by alternating between periods (Say, 5 minutes or so) of more intense and less intense climbing. Varying the intensity will allow you to give more focus during the intense period and relax a bit or hone technique during the easier interval. During a typical ARC workout, I will keep a pretty good sweat going and will be breathing steadily as you would for a moderate-intensity run or bike ride. – Movement Technique Training: Most technique training should be done in the low intensity range. When new techniques are introduced, the intensity should be very low, but eventually you will need to increase the intensity to “stress-proof” your technique. At some point you will find yourself using these new skills on a limit-level boulder problem or redpoint crux, but you can’t consider yourself a master until you are routinely applying the technique while onsighting at your limit. Usually in such a scenario the intensity will be very high. – Hypertrophy and/or Muscular Strength Training: This phase can be tricky because its not black or white. Let’s assume that we are following a strength building regimen that involves different “exercises”, each with multiple “sets” of a varying number of “reps”. Each individual “exercise” should be done to failure or very near failure, implying 100% intensity. However, it is unlikely you can achieve failure at the last rep of the last set if you give 100% intensity to each prior rep. Generally your intensity should ramp up as you work through the sets. I generally use 3 sets for a given exercise, so the first set will be around 80% intensity. Not “easy”, requiring attention, but completely in control. I will be fatigued at the end, but I could do more reps if I wanted to. By the third set, I will be breathing heavily, perhaps trembling a bit, my form will just be starting to suffer and I will be giving 100%. For a 5 rep set, by the 3rd rep or so I will have doubts about my ability to complete the set. By the end of the 5th rep I will just about be sliding off the hold. If you’re a screamer, you should be screaming on the 4th & 5th reps. The second set will be somwehere in the middle, starting out controlled and perhaps relatively casual, but will feel very difficult by the end of the set. If this doesn’t sound familiar, increase the resistance until your experience is similar. If you are applying the proper intensity, you won’t be able to handle much more than 20 total sets in a single workout (i.e., 7 exercises with 3 sets each). – Power/Max Recruitment Training: This one is pretty simple on paper; give 100% or more to each set, once you are properly warmed up (if campusing, your warm-up should inlcude some low, then moderate intensity campusing), then rest however long you need to be able to give 100% again. The tricky part is summoning 100% intensity for a 5-10 second effort. In my experience that is easier to do during a progressive strength training or power endurance routine, where you can gradually dial up the intensity over several minutes. In a true Power scenario, you will need to summon that intensity very quickly. A gradual warmup can help with this, as well as learning how to tap into elevated states of arousel. The cliff notes version: screaming, boisterous encouragement, and aggressive breathing can all help with arousel. Fortunately dynoing can be painful if you aren’t very accurate, and pain will help stimulate arousel as well. Succeeding on every set is a good sign that the intensity is too low. If you’re really attempting the most powerful movements, you should be failing most of the time. Another indicator is number of movements in a single set. True Power or Max Recruitment should trend toward a single extreme movement, but certainly no more than five. In my experience after three movements you can’t really give anything more of value. If you’re doing more than that, and they’re all ‘hard’ moves, then the workout is not really targeting Max Recruitment. As for warming up, while its important to be thorough, be careful not to waste all of your power during your warmup. Power is the first thing to fade during a workout so experiment with different warmup lengths and keep track of what works best (I’ve seen a clear decline in performance when my warmup last more than 45 minutes). Finally, once the warmup is over, there are no easy campus sets. If you can’t give 100% effort then the workout is over. Move on to something else or save it for antoher day. In this example, only the 2nd movement is truly at my limit, the others being mostly window dressing. I’m not a grunter, but I did grunt spointaneously during the hard move. – Power Endurance Training: Similar to Hypertrophy, PE workouts should begin in control but get progressively more intense to the point where you can just barely finish. Near the end of the last set, my motor skills will be totall shot, and I’ll have to swing my feet to get them from hold to hold; every hand movement will become a dyno. At the end of my best PE workouts I literally feel like vomitting and passing out (not necessarily in that order). My breathing is completely out of control, on the verge of hyperventillating, and I can’t stand up unsupported. My forearms are totally pumped; not only can I not squeeze anything, I can’t relax my grip either. When I go to record my effort, its difficult to write because my hands are shaking. Unless its extremely cold, I’m dripping with sweat. Some plans suggest taking a 10-15 minute break and then repeating the workout. There is no way I could do this, and in my opinion if you can, then the intensity is too low for PE (but it would make for great stamina training). 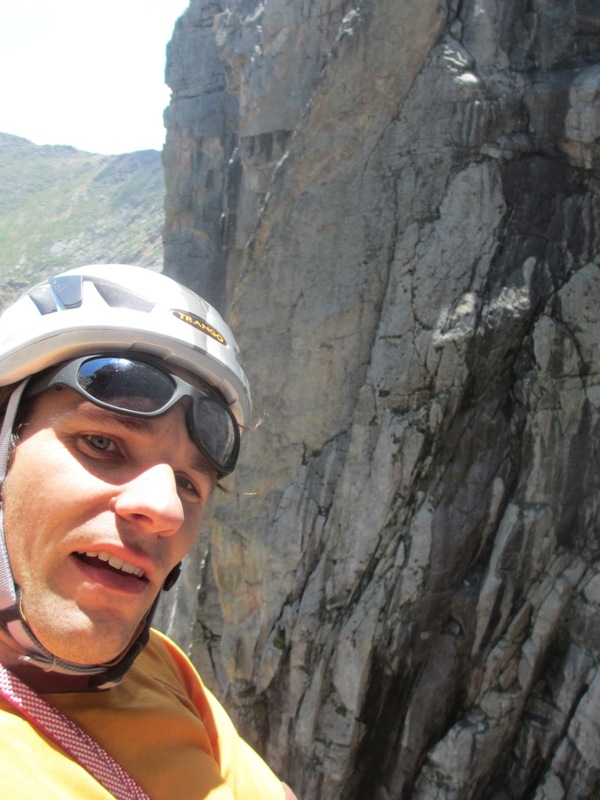 – Rest: A bit tongue-in-cheek, but many climbers aren’t very good at resting. Proper rest will probably take some effort. Digging a trench, building a retaining wall, running a marathon; these are not rest activities. Plan to do basically nothing for at least a week, and take it easy on your fingers for the entire rest period, or add anditional rest time once the retaining wall is finished. Beyond an understandable lack of knowledge, the second most common cause of improper intensity is a simple lack of effort in one form or another. This is usually not caused by laziness, but a number of other possible causes including external distractions during the workout time, unexpected interruptions, general fatigue from overtraining or lack of sleep, and other factors that culminate in a gneral lack of focus on the task at hand. At the end of the day, you’re unlikely to get much out of your training program if you’re just going through the motions. I’ve found myself in this position on many occasions. If you’re scratching your head after a season of ho-hum results, think hard about the effort you put into your training. 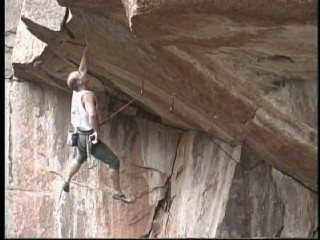 Were you giving it 100% (when 100% effort was called for), or were you mailing it in through your Hypertrophy phase, just counting the workouts until you could start bouldering again? Did you save some strength for the Campus Board during you Max Recruitment phase, or did you blow all your power during your so-called warmup? Most of us have a large resorvoir of desire and are able to access it when needed*, but focus and attention are not so easy to maintain. The majority of my own sub-par efforts stem from a lack of focus or attention when the opposite was required. Fortunately this can be simple to correct once you learn how. Look for more on this topic in the near future….